It's a contentious beginning to the issue amid Senoa's exaggerated telling of how Hannah was expelled from Mage University. The story is rooted in truth despite the mean-spirited flourishes fueled by Senoa's anger and malice. It forces Hannah to bare her soul, explain in detail, and expose herself like never before. The friction among Queens escalates, Hannah feels betrayed, hope seems lost and this fierce band of maidens is as splintered as ever. Anytime you see the perpetually upbeat Betty throwing in the towel you know things have turned for the worst. The turmoil among the Queens in a way mirrors the shaky creative history of the book itself. Ever since co-creator and original artist Roc Upchurch left the series, the book has taken a while to find its legs again. Fans love continuity but when beloved characters are suddenly altered, either narratively or physically, it can throw readers for a loop. Writer Kurtis Wiebe has done his best to keep the ship afloat with engaging stories and talented fill-in artists but there remained something intangible missing. With this emotional turning point in the series, it feels like a rebirth as much for Hannah as it is for 'Rat Queens' as a monthly comic. Tess Fowler seems to have settled in as the regular artist providing some of her best work to date. Her designs look more confident and cleaner. She's putting her stamp on each Queen with distinctive looks that are true to the characters while adding some newer touches. Her design and redesign of Hannah, in particular, is incredibly impressive. As usual, Tamara Bonvillain does a great job of paralleling the tone of the story with the perfect colors. Bold reds, somber purples, and ominous blues make the scenes more powerful. 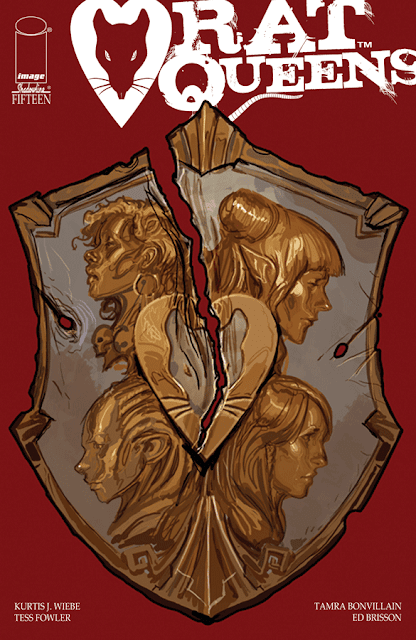 'Rat Queens' #15 marks a shift in tone and narrative as the friends are driven apart. It's a welcome change that will inevitably bring them back together hopefully stronger and just as exciting and fun as when it all started. This heart-breaking issue raises the stakes on an emotional level clearing the way to a new beginning for Hannah and her "sisters."